The Government is not intimidated by the alleged murder carried out by an armed criminal group against a number of road construction workers in Nduga District, Papua, President Joko ‘Jokowi’ Widodo said. 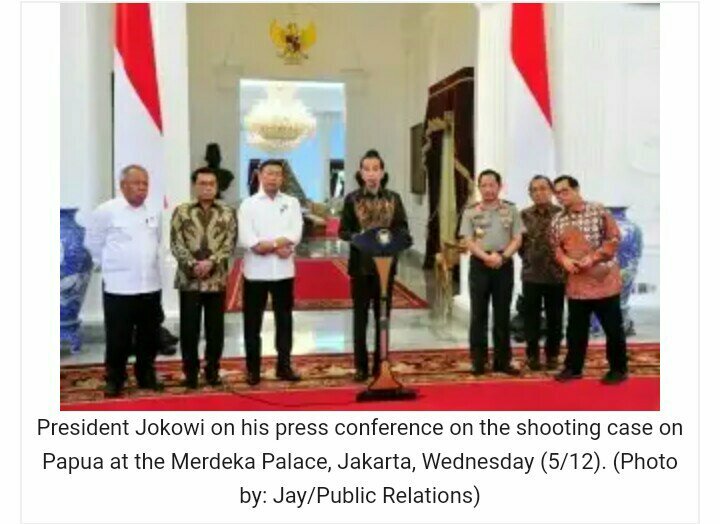 “This (case) has even strengthened our determination to continue our work in Papua,” President Jokowi said in his press release at the Merdeka Palace, Jakarta, Wednesday (5/12). According to the President, he has ordered Minister of Public Works and Public Housing to continue the construction of the Wamena-Kenyam-Mamugu road and the 4,600 kilometer Trans Papua road, while on the read connecting Wamena to Mamugu, there are 35 bridges to be built. “This must be completed immediately. The Ministry must continue development in Papua to provide social justice for all Indonesian people ,” President Jokowi said. The infrastructure constructions in Papua, the President continued, is indeed very difficult since the terrains, geographical locations, and weather are located at the 3,000-4,000 meters altitude above sea level and the constructions at some locations even has to involve helicopters to carry out heavy equipment and asphalt. “It is very different from road construction in Java,” President Jokowi said, adding that security measures at certain area are weak so sometimes the construction must be halted to secure the area. Regarding the brutal murder that was allegedly carried out by the armed criminal group against infrastructure workers, President Jokowi said he had ordered Commander of Indonesian National Defense Forces (TNI) and Chief of the Indonesian National Police (Polri) to pursue and arrest all the perpetrators of the crime . “There is no place for armed criminal groups like this in Papua and in the country as well,” the President added.